Red Tail Amazon Catfish! SAY WHAT? State Record Red Tail Catfish? 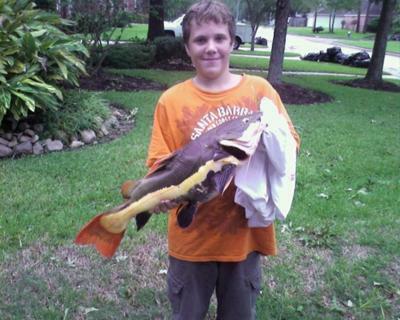 I was fishing in a neighborhood pond in Spring, Texas, just a day after Hurricane Ike hit the gulf region. I was standing on a bench because everything else was flooded. I was using two split shots with a 2/0 hook with a piece of hot dog on the hook. Crazy right? All of a sudden I hear my drag go zzzzzzzzz and my line is ripping off feet by feet. It takes it at least fifty yards straight left and it is fighting like crazy. After about 30 minutes, the fish gave up and I landed the Red Tail Amazon Catfish. Best fighting fish I ever had in my life, and I've fought fish from 8 pound bass to 120 pound tarpon. I was surprised when I put it on my bench as I was wondering what it could be. I called my dad and we looked it up and sure enough it was the Red Tail Amazon Catfish. It was the state record for Texas. The previous record was 2 or 3 pounds. This one stood at 13 pounds and 27.25 inches long and 21.5 inches in girth. We sent it in to the state of Texas and they said I couldn't have the record because I didn't use an agricultural approved scale to weigh the fish. Instead they sent me an outstanding angler award. I released it and the state record is still at large! Comments for Red Tail Amazon Catfish! SAY WHAT? 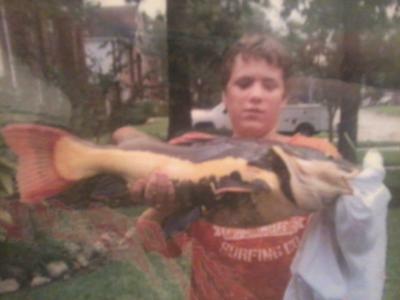 What A Nice Red Tail Catfish!!! That's an awesome red tail catfish! I've never seen one personally in my life, but that is a very cool looking fish. Good job young stud! Keep on fishing, buddy!